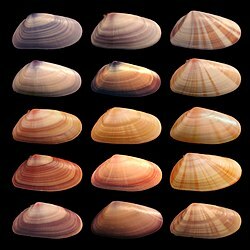 The shells o individuals within the bivalve mollusk species Donax variabilis shaw diverse coloration an patternin in thair phenoteeps. A phenoteep (frae Greek phainein, meanin 'to show', an typos, meanin 'teep') is the composite o an organism's observable chairacteristics or traits, such as its morphology, development, biochemical or pheesiological properties, behaviour, an products o behaviour (sic as a bird's nest). This page wis last eeditit on 3 October 2017, at 19:24.